Part of the "Hamelman Challenge", I made this Cheese Bread using the white levain, pretty much to the recipe. I'm afraid I couldn't extend to Parmegiano Regiano, but I did have a half decent Farmhouse Mature Cheddar Cheese to use as substitute. As with all the breads made at home, this is solely reliant on natural yeasts, so it took a considerably longer time to prove than Hamelman suggests in his book. I made a small loaf in a banneton which was underproved. So, I just allowed the loaf in the Pullman Pan to prove for about 3 hours before baking; this was after a 2 hour bulk proof, so I was really pleased with the end result. It is to formula, found on pp.180-1 of the book, apart from these alterations. Given I bought 3kg of Organic Rye Berries and 3kg of Organic Cracked Rye Grain, I want to keep on producing "Pumpernickel-style" breads. 8 hours steaming works so well; keeping qualities are unsurpassed. We both love this bread...lots and lots! This one's my own recipe, shown below. I made it as one BIG loaf in a banneton, using bran as a topping to the bread, which weighed in just short of 1.4kg prior to baking! 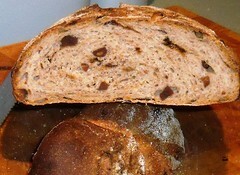 The flours are all organic; the formula is as straightforward as can be for this type of loaf. Bulk ferment time was about 2 hours, with 2 S&F in that time. Final proof was similarly 2 hours. I do so love using rye sourdough to leaven any type of bread. This loaf makes me think of Leader's Pane di Genzano, and yet the 2 formulae have little in common. Can't wait to try it! Bake profile utilised steam, loaded at full heat of 250°C, reduced to 220°C after 10 minutes, then 200°C for the last 20 minutes of a 50 minute bake. The end of the student academic year approaches. Currently we are building 2 College Buildings out of Cake ready for the EAT Food Festival held in Newcastle later in June. At the end of April we played host to Warburtons to celebrate National Bread Week; the first week of May. A huge organisation, and massively successful baking company; this was a great opportunity for the students, and they all did the College and themselves proud. They divided into 3 groups and designed their own loaves to produce and present to a Senior Manager at the local Warburtons Bakery in our city. Hamelman's Roast Potato and Onion Bread was the inspiration for one group, and it was soo moist; probably my favourite on the day! Another group was led by a baker from Sicily, and the recipe lent heavily on the Semolina Bread I posted on not long ago. Both these breads were made using a Biga Naturale, prepared and fostered by the students themselves. The winners went down the seed route in a big way, and adopted rye sourdough as a means to pack a punch with flavour. Clearly this impressed the judge! They actually made Pain Siègle, a Wholegrain Chollah with seed topping, and a "Couronne" of rolls using rye sour dough and topped with seeds. Some photographs are attached. Most of these are taken on a mobile phone, so, apologies for lack of quality. I don't seem to have posted on the blog for a while; hope this keeps up the interest! it's a really marvellous and colorful companion. I like especially the look of the pinkish bread (the one with cheddar cheese?) although I bet that I'd like better the pumper, as always! The nut bread must be a real pleaser to eat, too. The Cheese Bread is the pan loaf and the small round loaf hiding on the back left. 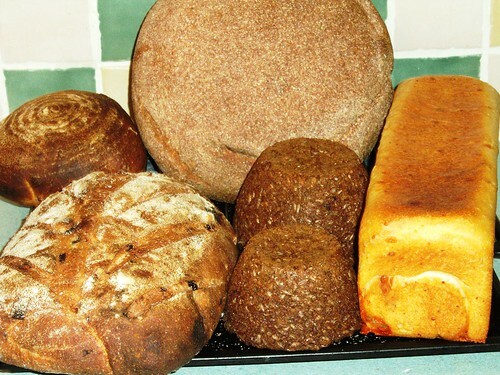 The large round loaf topped with bran is the one with the lovely pinkish crumb, and that is the wholegrain loaf. That's the best of the bunch, and I'm sure you'd like that one a lot too! It's leavened with rye and is predominantly wholegrain flour. Super simple and super tasty. Pumpernickel still underwraps for a good few hours yet! and beautiful photos...excellent comments and follow-ups. You should be very proud, Andy. Great work! I've remembered I have the formulae for most of the students work too. I'll add them to this post soon. The semolina Sicilian Scroll and the Roasted Potato and Onion bread are based on Hamelman's formulae, but we worked together to come up with 1 biga which would work for both breads, and adjusted the formulae accordingly. Then the students looked after the creation and development of said "biga naturale" from there. The Chollah is my standard recipe with a short time ferement. 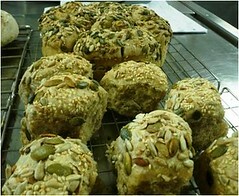 However, it is half wholemeal and half white flour, and it is generously topped with seeds. The Pain Siegle is a little like the simple formula published above. The seeded couronne is derived from the same Pain Siegle, but with added seeds. Yes, they really were all winners on the day! Thank you again for your generosity in sharing your knowledge and experience—and that of your talented and fortunate students. I am most facinated about the HB pumpernickel. It looks a killer! Say, which did you lke better the panned chease bread or the one from the banneton? How did putting it in a pan changed the outcome? Naturally, the breads are wonderful. The thing that stands out for me is your most fortunate students and the success of the competition. These young people are the future of baking and the skills learned at your hand will prepare them well for the future. Good job my friend. I have been so busy marking the Higher Education students work, and dealing with Internal and External Verification to ensure these students complete their courses and ready to move up to the next grade next year. Four of the first year group are coming back. I'm really proud of them, and think any one of these four has the potential to make it big in their specialist area: 2 are into bread, one's magic with cake and flour confectionery, and the other is a fantastic cake decorator! This Competition took place over a month ago now, and I've been wanting to post on it ever since, as I think I mentioned to you? I was in the Office one day when a girl from a local advertising agency rang up saying she was representing Warburtons and did we have any students to put forward to be involved in National Bread Week? I've been wanting to get in with Warburtons for some time. I have a good relationship with Allied Bakeries, also in the region, as well as a handful of the local craft bakers. Prize for ALL of us is a trip to Warburtons Bakery on 25th June...result! As for those 3 winners, they received the little glass trophy you can see, plus a Certificate each, plus £50 each to help with their studies. How cool is that? The College got a decent amount of press coverage to boot; bound to help as we recruit students for next year. Best news so far this holiday is that the girl in the middle of the photo holding the trophy has applied for an apprenticeship just this morning. One of the local craft bakers had e-mailed me yesterday to ask if I had any students interested in a trainee position. I told Katie straightaway, and she's already applied! Fingers crossed on that XXXXX! thank you for posting kind remarks. We absolutely loved the panned cheese bread. Very strong flavours, in lovely soft white bread; not the revolting pappy stuff, however. The boule was somewhat underproved; I haven't cut into it yet, but I'm not that impressed as yet. However, the fact is that the panned loaf sat and proved away slowly for another hour and a half before baking, once I'd discovered how much more the dough had left in it: testament to high quality dough I suggest. I'll attribute that as much to the raw materials and Mr. Hamelman's formula and process as I will to my own levels of control of all the factors; my job was made easy really. HB: there's a load of info about it right here in my other blog postings. You should also pay a visit to the good fellow who's posted just below. Eric has worked on HB as well, and we've shared a lot of ideas on it, particularly the concept of steaming rather than baking the loaf. It is a "must-try"; give me a shoutback on anything you need when you come to make it. Good to hear from you and yes, all these loaves have turned out as "my kind of bread." Enjoy the Nury; one I've yet to make, as Leader's book seems glued to my cupboard in College, and never gets back home...one for the Summer holidays per chance? Feel free to take the rye bread I made; all the details are posted above, and it's a simple formula. Yes, indeed; up the girls! 3 of the 4 returners are female. I'd say more than half of all my bakery students have been women. That's a really good thing to me; it brings me more hope for a brighter future for the baking industry. Let's break down some stereotypical boundaries! I'm really interested to know more about your food mapping project. If you have time can you post a few lines here to give a little more detail? Very nice assortment Andy! I think you'll be pleased with the substitution of cheddar in your cheese bread. I've been making sharp cheddar cheese bread at the holidays for friends and family for years now, and toasted with a little butter it is heavenly. Yes, I'm more than happy with the Cheddar substitution. Parmesan weighs in at £18/kilo over here. A very good cheddar can be had for less than half that price, and the flavour in a baked product is considerably more intense, I suspect. We have quite a lot to enjoy; very lucky people! Many thanks for writing about this; very interesting, and keeping all the food edible too...what a challenge! Our buildings form part of a "map" of Newcastle upon Tyne constructed using 100 iconic buildings in the region. This forms a centrepiece in a secret location, which is revealed just a few hours ahead of the key gathering event of the EAT Festival. The idea is that the space around the cake map is there for people to gather for a picnic. So, the buildings don't get eaten, but food and company is shared. That decadent side to cake decoration has always troubled me; it's a fundamental about why I'm so passionate about bread, but really not turned on by the sweet stuff at all. Still, I think it will be a major event, and the Festival will be a fun time to be in the city. Great array of breads, Andy! I love that you are encouraging your students creativity and risk-taking. I'm sure they learned a lot from their successes, big and small, and it's a great way to test their knowledge of the fundamentals. You sure were a busy bee. I would be lucky to pull off two types of bread in one weekend. The brazil nut and prune loaf especially strikes my fancy. I bet it would be great for a cheese course. It is great to see that you are spreading the gospel to your students. 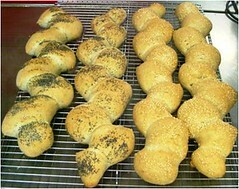 I would love to develop my skills further and be able to teach breadbaking when I retire from my day job in four years. Thanks for updating us on what's been keeping you busy, Andy! A great assortment of breads! By the way, what kind of textbooks/written learning material do the students use? David, I get such a range of students with diverse interest and specialisms. The greatest pleasure is always to watch students "feeding" off each other. So if we are doing complex fermentation one week, a real bread fan will step in and take the lead, and others will fall in behind. Then we may do cake decorating another week, and the real bread fan will be attentively following the lead of another member of the group who is more skilled in this discipline. So, yes I do stretch the students, but it's even better to watch them stretch each other! I'm sure you know where I'm coming from. Don, I thinked I picked a really sensible range of breads to make, and that allowed for a relatively easy production schedule. Afterall, there is nothing more annoying than putting in all the hard work to find you have all the breads ready for the oven at the same time! Steaming the Pumpernickel takes that away from oven schedule. The rye was more potent than the wheat levain, so I made that first to ensure this was ready in good time. The other 2 doughs were a little more problematic, but it worked well in the end. Both formulae were from Hamelman and, as normal, were faultless. However, I think the timings he uses are for the breads made WITH the small amount of yeast he has in his formulae [although often he states this is optional]. I didn't use yeast, but had plenty confidence in the power of the wheat levain I'd prepared. As you may have noted the small boule of Cheese Bread is horribly underproved. However the Pullman Pan loaf turned out nigh on perfect, and that with 2 hours of bulk and 3&1/2 hours final proof on a nice warm day [say 26*C in my kitchen]. By the way, I think you have loads of skills already; plenty enough to make you a great asset should you decide to do any teaching. 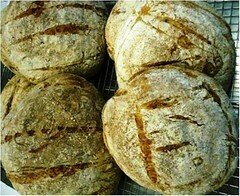 Another great post with some great breads, good to see bakeries invovement in their future. I too like HANS would be interested in the learning materials that you employ if that is at all possible. 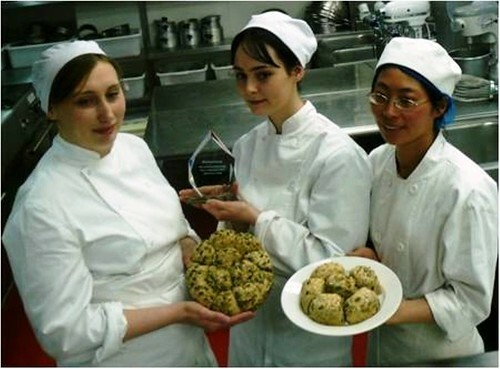 There is a whisper that our college is wanting to expanding its baking capacity as ther is only 1 college doing training for the baking trade. I am still so glad that i have kept my trade training notes all hand written and still usefull today, it is a real buzz to be with young and not so young students that are thirsting for knowledge and know how. I was recently invited to a Hospitailty Industry Association dinner at a top hotel for the young students having a hit out for a prestigeous showcase dinner that they will be presenting for 500 Industry guests. I found it very interesting as we had to critiq the meal and this was their 2nd trial before the actual dinner. Others had been to the first hit out so were able to comment on changes that had been made. unfortunately the main dinner to which i was also invited was on whilst i was away prospecting, i have yet to return to work to see how it all went. My only involvement was to spend an evening in our bakery with two of the girls that were making the breads that were to be of a middle eatern theme. They settled on a filled Fataya and a very mini spiced doughnut so we had fun working on sizes etc and dough formulas but great to see their enthusiasm and on the hit out there interpretation of what we had tried. How is the wood fired oven progressing? Thanks for posting on here. I've put a link up above to take you to the info on learning materials. I remember years back when I first started at Melmerby Village Bakery. A time-served and vastly experienced baker called Roger started the same day as me; 1st August 1994. A couple of months after this we were having a discussion about croissants, as we came to thinking the method we were using, as directed by the owner, was not the best, or, conventionally speaking, correct. These croissant were made with a portion of wholemeal flour. I was amazed when Roger turned up one night with an incredibly battered A4 hardback booklet. Inside, all in very neat, large handwriting were all the recipes, formulae and methods for all the products he covered in his time as an Apprentice Baker. Roger is now in his 70s, so I guess the book went back to the 1960s. I don't think he's shown that book to many people, but it was so special to see what was inside. The bakery students do supply up to our Restaurant, and through to the School Bistro too. I quite like where we are positioned actually. Baking is classed as Food Manufacture in terms of syllabus group. This makes me quite separate from the rest of the staff in our department as a whole, as they all teach Catering and Hospitality. I think I get the best of it: there's a lot of mutual support, and sense of working together for business; bit I also enjoy a sense of independence; much respect for what I do, and for the student input and output, but also, a willingness to let me just get on with it, and develop the future provision. copyu reminded me about this; thanks for that. Roast the onions and potatoes in some olive oil. Set these to one side to use the next day. If you season these with salt, that needs to be taken away from the recipe shown above. That means you need to weigh any salt added first, so you know how much to take off! This dough was used to make loaves in bannetons, baked on the sole of the oven, and some "couronne" of roll pieces, topped with a generous mixture of seeds: the overall Competition WINNER! Make the Biga 12 hours ahead. Mix using the autolyse principle: With the paddle beater loosely combine the flour and water. Leave to stand for 20-30 minutes. Attach the hook, add the biga, potatoes, onions, yeast and salt and mix on 3rd speed for 3-4 minutes. Divide into 4 pieces of 1kg and 5 pieces of 510g, taking care not to degas the dough. Shape into loose rounded dough pieces using minimally- floured hands. Set to prove upside down in banettons, dusted with flour. Prove at 35°C, 80% rH, for approx 50 minutes. Make the Biga the day before, allowing for a fermentation period of 16 - 18 hours. Put the Biga, soaked semolina and all of the other ingredients in to the Spiral Mixer to mix for 15 minutes. And check now and then if you need to scrape the bottom to help the mixing until you develop a silky and smooth dough. Put the dough in to a container lined with a little of olive oil. Cover with cling film and Bulk Ferment for 45 minutes. Scale and divide dough in to 1kg for the large Bannetons, and 460g for the small Sicilian Scroll or for the Epis. Mould round and rest covered for 10 minutes. Prepare the trays with silicon paper with a dust of Semolina flour. Shape the dough in to long shaped sausages and then mould it in to a S shape. Brush them with water and dip in sesame seeds. Carefully place the shaped dough on to the dusted trays. Prove at 35- 40oC, 80 % rH, for approx 45 - 55 minutes. Bake in the sole of the oven. Oven profile is 235oC, top heat 7, bottom heat 5. Use steam set at 2. Total baking time 25-30 minutes. Check after 15 minutes and open damper. If necessary after 20-25 minutes drop the heat to 225-220oC for the last minutes of baking time. Makes 2 Chollah loaves, topped with seeds. Oven profile: Use steam set at 2 if available. Bake at 180°C; top 6, bottom 5, for 28 minutes. Open the damper for the last 5 minutes of bake. Whisk all the ingredients for the ferment together in a steel bowl. Cover with cling film and set in a warm place for half an hour. Mix all the ingredients, together with the ferment, in an upright machine with a hook; 2 minutes on first speed and 6 minutes on 3rd speed. Mould round and rest 15 minutes, covered. Line trays with silicone paper. Roll out strands to 9" and plait acording to instructions. Double brush with beaten egg. Top with a generous mix of pumpkin, sunflower, sesame, flax , mustard, and poppy seeds. Set to prove. Prove 50 - 60 minutes at 35 - 40°C, 85%rH. Bake as oven profile. Cool on wires. Thank you so much for sharing these formulae. They look so appetizing that I can hardly wait to try some of them. I'll be using my clumsy 'hand' methods, though—no 'machinery' here (worse luck!) I'm sure others will find the mechanical mixing details in some of those formulae very useful, however. Your students have obviously got the 'fundamentals' of baking down pat, but it looks like they also have some creative flair. Kudos to their instructor!